It’s also another interesting package. 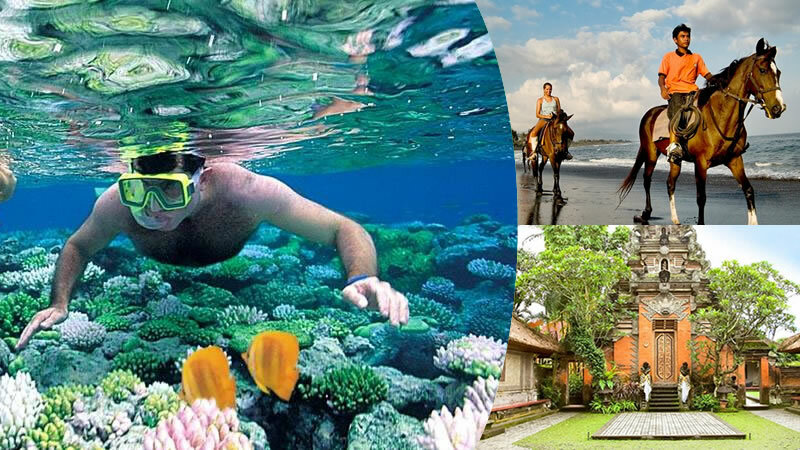 Tanjung Benoa Snorkeling with Bali Horse Riding + Ubud Tour is a great water sport tour package where you will get enjoyment with two activities in the same day. First, doing cool snorkeling activity at Tanjung Benoa beach, and second join a nice Bali horse riding for 60 minutes at Saba Bay. Next, you will be invited to visit Ubud art village. This combination package tour will give you unique experience during your marine water sport in Tanjung Benoa Bali. Don’t miss it and book your Bali water sport package only with us. Private tour with fully air-conditioned car. Ticket for 1 hour Horse Ride at Saba Bay. Infant under 2 years is free of charge.